Milkshake IPA brewed with raspberry, strawberry, blueberry, vanilla beans, lactose, and a huge Mosaic and Citra dryhop. Barney Blood is a Milkshake IPA brewed with raspberry, strawberry, blueberry, vanilla beans, lactose, and a huge Mosaic and Citra dryhop. With the hazy appearance of a purple-pink smoothie, this beer has a thin slightly pink head. Dank citrus aromas are present from the hops and complemented by with tart berries. Leading with tropical fruit flavors of papaya, grapefruit, and mango, it instantly shifts to tart berry. 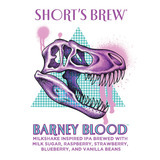 Full bodied with a very smooth mouthfeel, Barney Blood finishes slightly hoppy and creamy.